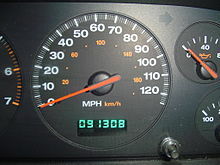 An odometer or odograph is an instrument that shows the distance traveled by a vehicle, such as a bicycle or automobile. It can be electronic, mechanical, or a combination of the two. The name comes from the Greek words hodós ("path" or "gateway") and métron ("measure"). It is sometimes called a mileometer or milometer. ↑ "Oxford English Dictionary (online):''odograph''". Oed.com. Retrieved 2011-11-12. ↑ "American Heritage Dictionary (online: Dictionary.com): ''odograph''". Dictionary.reference.com. Retrieved 2011-11-12. This page was last changed on 21 June 2016, at 09:32.